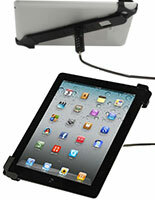 Tradeshow tool weighs very little & is easy to carry or reposition. 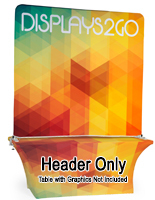 Straight display is basic to focus a customer's attention on the promotions. 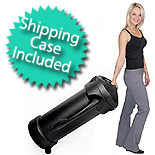 Provided case keep items protected when traveling to a tradeshow. 46-1/2"h display works perfectly on top of a counter. Tubular frame takes minutes to set up without requiring any tools. 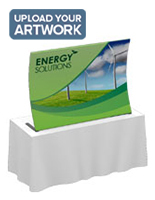 This custom table top display is designed for use on top of a table, adding unique graphics to any presentation. The portable exhibit measures 66" x 46.5" and therefore suits a 6-foot-long tabletop. 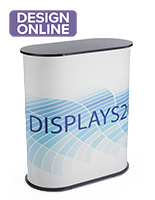 This custom table top display, also known as pop up graphics, stands completely perpendicular to a flat surface, using two rounded feet for stability. 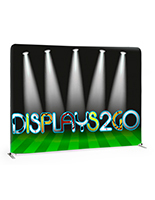 Unlike many of the newer exhibit booths and presentational options, which often have a curved design, this fixture is simpler and therefore more effective at displaying your advertisements. This custom table top display focuses a viewer's attention on the artwork itself instead of the contemporary stand used to showcase it. This portable fixture is incredibly easy to set up. Simply take each pole and attach them together using the snap-button system. 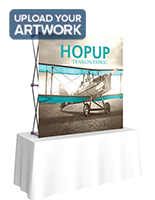 The custom table top display is even equipped with custom-printed graphics, which slide over top of the framing and zipper shut. The pop-up exhibit uses fabric material that is printed using a dye-sublimation process. The printing resolution is 600 DPI. 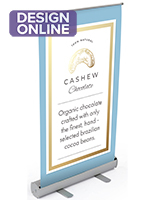 Another great feature of tabletop banner stands, as shown here, is a lightweight design. This custom table top display is even provided with a shipping case to keep all of the pieces organized during travel! The exhibit graphics showcase customized advertisements in a straightforward yet powerful manner. 19.0" x 45.0" x 19.0"